CONGRESS ST EXPO comprizes many tents south of Congress Street and west of I-10 Freeway in TUCSON, Arizona. Some horendous events took place on the February 3, 1998 that many will not forget. Nothing like this has occured in the 8 years we have been attending the show. The winds were blowing strong. There was a lot of tent flutter and dust blowing. 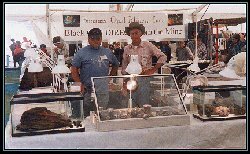 Exhibitors and buyers alike were trying to maintain their cool. Eventually the old Circus-like tent was blown apart and came down during the night. 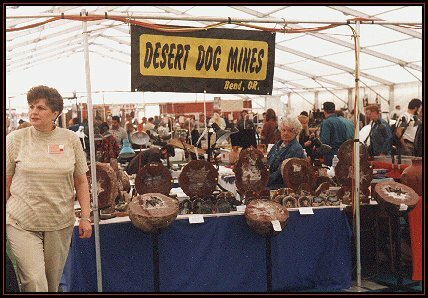 Exhibitors were prevented from entering the tent next day. Crews were working 24 hours a day to take down the old tent and install the new one. 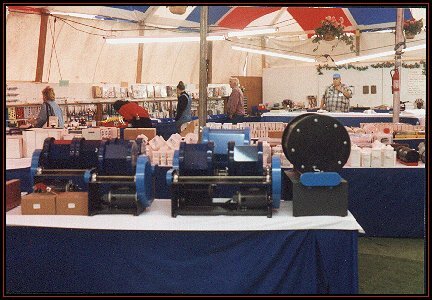 Exhibitors were eventually allowed to collect and remove their things. On February 6, the new structured tent was in place and exhibitors were allowed to set up. 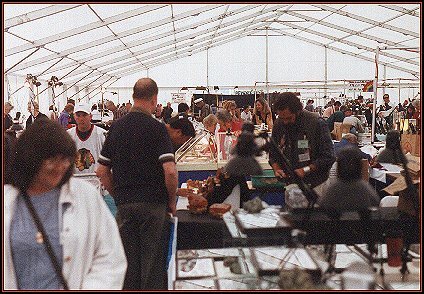 On February 7, the tent was opened for business. were under the big tent when it was blown apart. 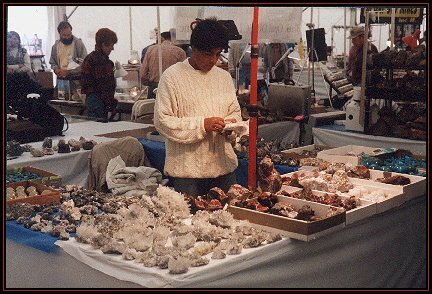 Here they are back in business selling their large Thundereggs. has some nice mineral specimens from peru. Two specimens were damaged by the event. 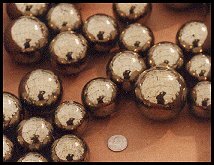 He also has some nice spheres made from large pyrites. We have these available for sale. from 1-1/4" to 2-1/2" in diameter. Here are the "two Larry's" attending the Booth in the new tent. Larry Stenstad (at right) is the Marketing Director. We have cut and uncut stable opal available for sale from this mine. Also we are selling a giant-sized opal specimen discovered at the mine. was under one of many other tents at the CONGRESS ST EXPO. Their tent received a lot of flutter, but did not come apart. Books and other items were constantly falling off the walls. An 8-foot-long fluorscent light fixture fell from its position while I was in the tent. It fell against a table. The 8' long bulbs popped out but were unbroken. luckily no one was under the light fixture when it broke loose.